During four months prior to the fourth anniversary of its landing on Mars, NASA´s Mars Exploration Rover Opportunity examined rocks inside an alcove called "Duck Bay" in the western portion of Victoria Crater. The main body of the crater appears in the upper right of this panorama, with the far side of the crater lying about 800 meters (half a mile) away. Bracketing that part of the view are two promontories on the crater´s rim at either side of Duck Bay. They are "Cape Verde," about 6 meters (20 feet) tall, on the left, and "Cabo Frio," about 15 meters (50 feet) tall, on the right. The rest of the image, other than sky and portions of the rover, is ground within Duck Bay. 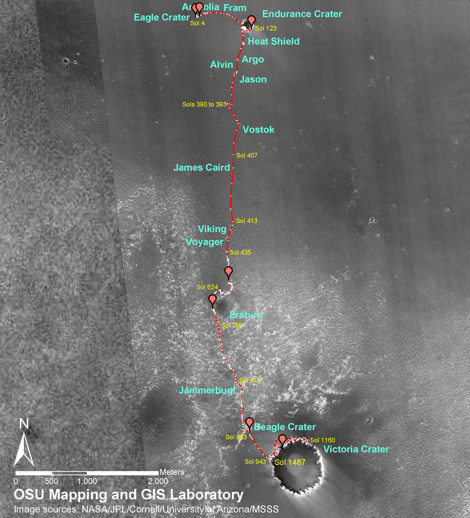 Opportunity´s targets of study during the last quarter of 2007 were rock layers within a band exposed around the interior of the crater, about 6 meters (20 feet) from the rim. Bright rocks within the band are visible in the foreground of the panorama. The rover science team assigned informal names to three subdivisions of the band: "Steno," "Smith," and "Lyell." This view combines many images taken by Opportunity´s panoramic camera (Pancam) from the 1,332nd through 1,379th Martian days, or sols, of the mission (Oct. 23 to Dec. 11, 2007). Images taken through Pancam filters centered on wavelengths of 753 nanometers, 535 nanometers and 432 nanometers were mixed to produce an approximately true-color panorama. Some visible patterns in dark and light tones are the result of combining frames that were affected by dust on the front sapphire window of the rover´s camera.